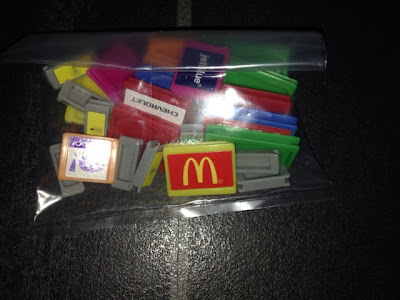 With Christmas approaching, I'm sure your kids all have massive lists for Santa and you want to make sure that you get as much of what they want as possible and leave behind the stuff that will be a novelty on the day, but will get thrown to the bottom of the toy box never to be seen again. Just in case you haven't seen the list you can view the Dream Toys 2013 here at Argos. As I am so lovely to my dear readers, I have been reviewing one of these fab toys - Monopoly Empire. 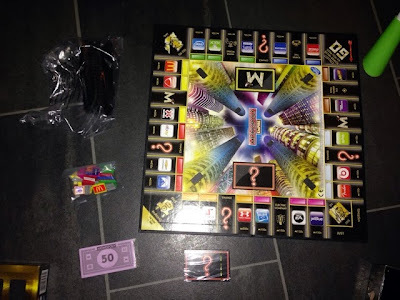 I am a huge fan of Monopoly as it is so I was excited to see how this game would differ to the original. The aim of Monopoly Empire is to build your tower first. The first player to the top wins! I took out all of the pieces and noticed that we had a few new additions as well as some omissions. 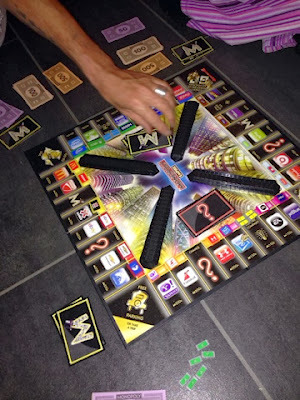 Towers, brand tokens and Empire cards (Get Out of Jail Free, Just Say No - meaning you can play it when another player has something against you) are all new. We still have Chance cards and tokens (instead of houses) whenever you own a full colour set. The money only comes in 500k, 100k and 50k. 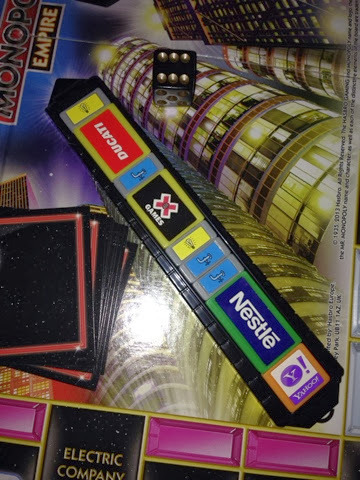 The brand tokens are all different sizes. The more expensive the brand, the bigger the token and therefore the quicker it will be for you to reach the top of the tower. 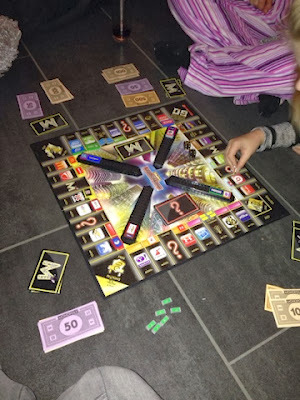 Just like the original Monopoly game, you have a banker and each player gets 1000k as well as 2 Empire cards at the beginning of the game which you can play at any time. 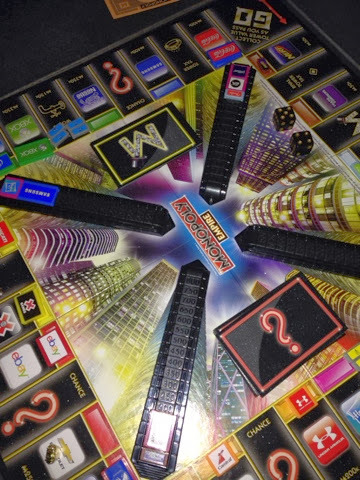 The towers have numbers on them so when you start placing tokens on them you will see a number above it. When you pass Go, instead of getting 200k, you get whatever number is displayed on your tower. If you have no brands, you get 50k. Another change in this game is the Free Parking space. In Monopoly Empire, you can either land on Free Parking and do nothing or pay the bank 100k to move to any space on the board. When you land on a brand that another player owns, instead of owing them the price of the brand, you need to pay them the number that is displayed on their tower. The die are a little different too. One of them has a symbol of two hands shaking. If you roll and it lands on that, you have the option to swap the top brand on your tower for the top brand of another players or you can just play on as normal with the number shown on the other dice. When we play the original Monopoly, the game normally lasts for hours and we end up getting bored. We played this game twice and the longest game only lasted around 45-60 minutes. It is definitely becoming one of my favourite board games and it WILL be out at Christmas for everyone to play. My sister even woke up the next morning wanting to play again! 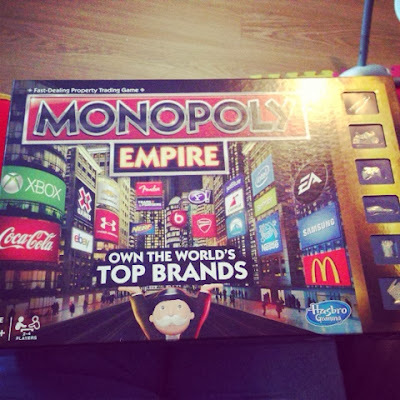 You can purchase your own Monopoly Empire for a sale price of only £13.49 here.